We spend a lot of time in bedrooms. Making these rooms appealing can ease some stress in your life. If done right, your bedroom can be a place for you to unwind, relax, and get the rest you need. 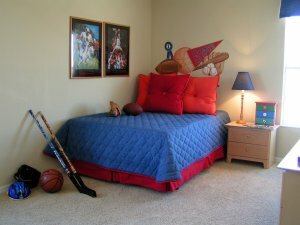 The tips in this section can help you create the right bedroom for you. You'll find ideas for decorating a kids' bedroom, building a closet, and maintaining the best temperature for the best comfort. The following articles are available for the 'Bedroom' topic. Click the article''s title (shown in bold) to see the associated article. A baby's room needs specific furnishings. Choose the right ones to keep your baby comfortable and safe. Decorating a bedroom can be fun, but it's not always simple to choose what items to place in the area. Use accessories that will help bring out the theme and feel of the room. What style do you want to use for decorating the bedroom? Bedroom furnishings can help you create the perfect look and feel for your room. Whether your living space is limited or you simply enjoy shopping, knowing how to build a simple closet can be an essential skill. Your friends and family will thank you for taking the time to learn this new skill! A child's bedroom can be a magical place where he or she can play and feel comfortable and happy. Let your child help decide on decorating ideas, and put the pieces of the room together to create the right look. If you are searching for new bedroom furniture, consider a modern look. Contemporary furniture adds a classy look to your room. Contrary to what many people believe, cooling down a hot room does not solely rely on your air conditioner. Here are a few easy and surprising ideas for you to use the next time you start to bake in the summer heat. If you have a child, then chances are you know just how much fun it can be to try decorating their room. Creating a kid-approved room has never really seemed to be an achievable dream, at least until now. Here is your opportunity to learn how easy creating a kid-approved room really is. The style of your bedroom reflects your personality and character. By following a few basic rules you can create your own perfect getaway. Decorating a bedroom means you'll have to decide what furniture you want for the room. Think about purchasing designer bedroom furniture to get the perfect look for your room. Are you interested in a beautiful, natural decorating style? Try a garden bedroom theme to get a fresh look. Finding the perfect furniture for a girl's room can be simple. Come up with a theme with the help of her imagination and go from there. While it is tempting to do so, there are other ways of heating up a cold room besides turning up the thermostat. Try a few of these options, and save some money at the same time. Picking out kids' furniture can be a fun task. You can go along with a theme or look for furnishings in colors and shades that your child likes. Are you searching for high quality, beautiful bedroom furniture? Oak is a great material that will look great in a bedroom.